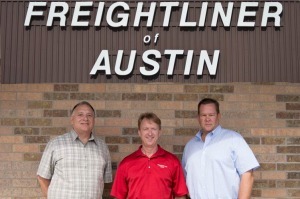 Freightliner of Austin is Your Vocational Truck Headquarters. Founded and continuously managed by Central Texas families since 1955, our dealership has served businesses across Texas and the United States with truck and commercial vehicle solutions for over 60 years. Our three managing partners have total combined experience of 75 years in truck sales and service. We know and understand the wide range of applications, challenges and methods for success in trucking. Our application and service solutions range from those familiar to and near Austin – including construction, pickup-and-delivery, refuse, government, severe-duty and refrigerated distribution – to others in neighboring regions and state – including highway, oilfield, bulk and small-business. The dealership’s present location on U.S. Highway 183 South – near Bolm Road – has been our home since 1985. As Central Texas continues to grow, customers now find us conveniently located near Austin’s major highway intersections and international airport. Our factory-certified technicians and parts experts fulfill our mission to ensure your Freightliner ownership and operation is the best decision you can make for your transportation business. Take Our Survey on Dealership Hours of Operation.